Erika DeSantis is a enthusiastic Fresh Air Fund host. When the opportunity to be the local host coordinator became available, she jumped at the chance to step up. Fifteen years ago, when their oldest son was a year old, the DeSantis’ hosted their very first Fresh Air Fund child- a good natured 8-year-old boy named Tyriek. Jeremiah on an excursion with the DeSantis family. Jeremiah is coming on Saturday to spend his second visit with the DeSantis family in Redding. He is excited that his family will be there in time to see the fireworks at Lonetown Farm. 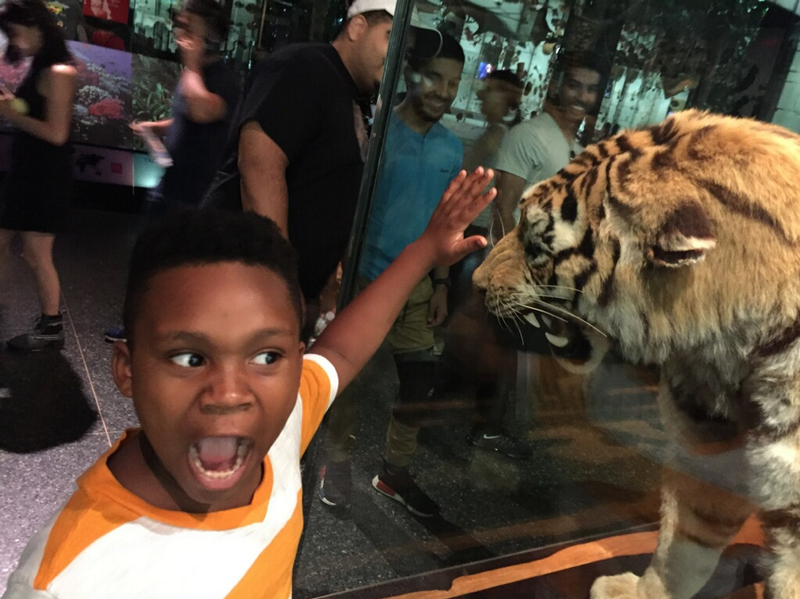 The 10 year, who lives in Harlem with his mom, April and 17-year-old sister, Bianca, really enjoyed last year’s visit. He thought the Maritime aquarium was awesome. He especially liked hiking with the entire DeSantis family which also includes their youngest son, Storm. Jeremiah loves meeting new people and looks forward to bungee jumping at the mall again. At his charter school, he enjoys math and science and wrestling. His mom, April, admits being a skeptical parent at first. But, she and Erika connected over the phone and both decided it would be a good fit. She liked that Jeremiah got to experience things that were both fun and educational. The families kept in touch throughout the year. Erika and April are both looking forward to meeting in person on Saturday. April said it was important to her that both families went through a thorough background check. Families are also matched for interests. Jeremiah’s mom was also happy that her son was comfortable enough to be himself. She feels that experience a different lifestyle and being familiar with diversity is very important. Erika would love to help you host your own Fresh Air Fund child. Contact her ASAP at 203-253-0833. The deadline is fast approaching! It’s always a bittersweet time for Redding as a popular teacher retires. For the past 22 years, Roni Mikolajczyk has been a smiling and loving presence to both children and adults at RES. During the Korean War, a Polish/German soldier met a French citizen and fell in love. Soon after, their daughter Veronique was born. They first came to the US when she was 3 but moved here permanently when she was 6. Veronique, soon to be called Roni, became a P.E. teacher 42 years ago and first worked in the private school world including schools for the deaf, until coming to RES 22 years ago. Roni calls it 42 years of fun! Roni has 4 children: Michael, an architect; Matthew who is in property management; Andrew, a contractor and Danielle who works at Adam Broderick in Southbury. Roni has 3 granddaughters. She has an incredible memory for all of her students. She admits to having made amazing connections with the wonderful families she has met. The little gym Haunted House at Halloween is legendary. She enjoyed the varied reactions of the children who experienced it, including special code words for kids that wanted to go through it and not be scared. Roni has left laminated instructions on how to set up the Haunted House for future generations. Mrs. M feels that Redding is a special community with uplifting neighbors who are there for each other. When her husband, Marion, passed away several years ago, her RES family helped her through that hard time. She is also thankful that the school has the equipment for students to try things like snowshoeing. “Overall, Redding kids always seem so happy to come to school” says the teacher who always makes the kids smile. Roni Mikolajczyk: you’re a major reason why! Roni has a retirement home in Vail, Colorado. She has plans to fill her time with favorite pursuits like photography, pottery, travel and flea markets. She hopes to stay in touch with the community here and encourages students and parents to email her at TeachPE1@aol.com. We’ll miss you and your ever present laughter, Roni Make-a-light -check! Redding Police Captain Mark O’Donnell is not saying goodbye to his Redding friends when he retires. The Monroe native and resident’s next gig will not be far away. One of his first jobs was in the security department at Masuk High and now O’Donnell is going full circle by returning to the Monroe school. His role will be as a member of the security staff and not as an SRO or SSO. 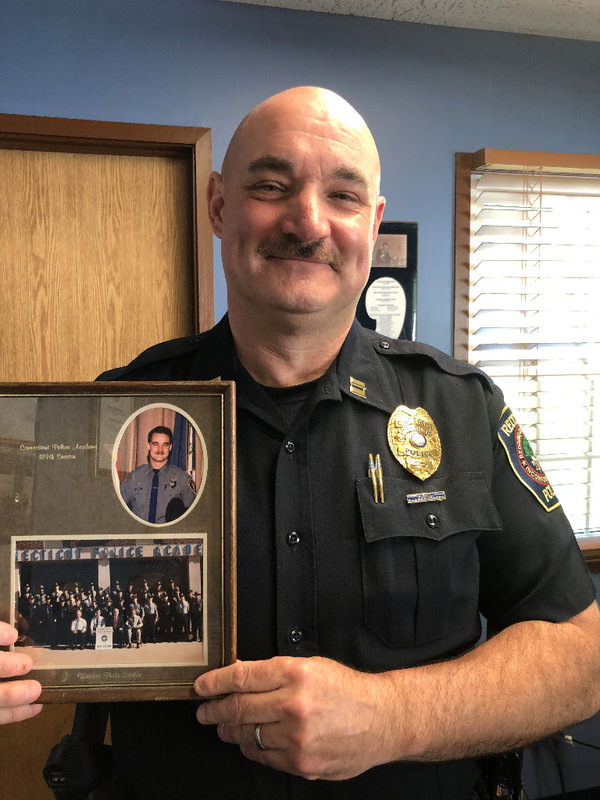 When the amiable O’Donnell began in the Redding Police department in 1985, the department was being run by State Trooper Joe Paola. There were 10 officers under Paola. When on a call, the door to the precinct would be locked with a sign to call the state troopers in Southbury if help was needed. A payphone was available outside the door since cell phones were not yet in use. Redding did not have a dispatcher until 1990. The popular cop has had many memorable moments in 33 years. One of his proudest is saving an elderly man in 2008. He and Officer Signore were called to the house at 2:15 am and had performed CPR before the ambulance arrived. O’Donnell remembers the man grabbing his arm when he was revived and not letting go. He has an award on his wall commemorating this event. A favorite traffic stop happened in 1986. He stopped a vehicle speeding on 53 just past the middle school. When he leaned into the Nissan Maxima Turbo, a famous pair of blue eyes peered back. Paul Newman was trying out a new racing engine from Bob Sharp Nissan. After O’Donnell gave the very pleasant Westport native a warning, they started to chat. Newman showed O’Donnell the new engine and then asked to see the engine of the police car. When O’Donnell mentioned that his dad was Newman’s meter reader, the star exclaimed, “Bob is your father! Whenever he comes by, he comes in for a glass of iced tea!” O’Donnell said he thought his father was making those stories up! One last anecdote has O’Donnell accidentally dropping a driver’s license on the ground. When he stooped to retrieve it, his pants ripped from seam to seam! He returned the license and backed up slowly. Luckily it was a dark night! And, also lucky that he lived in Redding at the time and was able to stop home for a change of pants. That taught him to always keep a change of clothes in his locker! O’Donnell has been the captain in the Redding Police Department for 4 years. Previously he was a lieutenant but received a change in rank because the second in command in most CT departments were Captains. Being on the road was his favorite part of the job and he misses that in his administrative role. He admitted to not missing foot chases though. He’ll mostly miss interacting with the public and staff. Captain Mark O’Donnell said he is leaving on his own terms and is very satisfied with his 33 years working in Redding. He looks forward to working close to home in Monroe. We’re holding you to that, Mark!